I've been to the Polynesian Cultural Center many times. I've always known that the center was owned and operated by The Church of Jesus Christ of Latter-day Saints (whose members are sometimes popularly called the Mormons or LDS). I've always known that the majority of the people you see in the villages, at the luau and at the evening show "Horizons" are students at the adjacent BYU-Hawai'i. What I didn't know much about for many years is the history of the Polynesian Cultural Center (PCC). Whose idea was it to bring students from all of Polynesia to college in Hawaii? What were the beginnings of the PCC? How did the PCC come to be the most popular paid visitor attraction in Hawaii? Here is a brief history of the Polynesian Cultural Center as provided by the Center. I've skipped some of the more elf-promotional material in the history. What is left, however, is a pretty straight forward history of the Center. As early as 1844, missionaries from the Church of Jesus Christ of Latter-day Saints were working among the Polynesians in Tahiti and surrounding islands. Missionaries arrived in the Sandwich Islands (Hawai'i) in 1850. By 1865, the LDS Church had purchased a 6,000-acre plantation in La'ie. The LDS Temple in La'ie - started in 1915 and dedicated on Thanksgiving Day 1919 - attracted more islanders from throughout the South Pacific. By the 1920s, Church missionaries had carried their Christian teachings to all the major island groups of Polynesia, by living among the people and speaking their languages. In 1921, La'ie had become very cosmopolitan - so much so that David O. McKay, a young Church leader on a world tour of Church missions, was deeply stirred as he watched school children of many races pledging allegiance to the American flag. That incident is depicted today in a beautiful mosaic mural hanging above the entrance to the McKay Foyer, a BYU-Hawai'i building named in McKay's honor. McKay envisioned that a school of higher learning would be built in the small community to go along with the recently completed Temple, making La'ie the educational and spiritual center of the LDS campus. Beginning February 12, 1955, under the direction of experienced contractors and craftsmen, the "missionaries" built the school McKay had foreseen decades before, The Church College of Hawai'i. At the groundbreaking ceremony for the college, McKay predicted its students would literally influence millions of people in the years ahead. (In 1974, the Church College became a branch campus of Brigham Young University in Provo, Utah. Today, BYU-Hawai'i is a four-year liberal arts school with about 2,200 undergraduate students). About the time of McKay's visit to La'ie in 1921, Matthew Cowley, was finishing his first round of missionary service in New Zealand. There, he developed a deep love for the Maori people and other Polynesians. In time, he also became another important LDS leader who was concerned with the erosion of traditional island cultures. In a speech Cowley delivered in Honolulu, he said he hoped "...to see the day when my Maori people down there in New Zealand will have a little village there at La'ie with a beautiful carved house...the Tongans will have a village too, and the Tahitians and Samoans and all those islanders of the sea." The potential of such a concept was well established in the late 1940s when the Church members in La'ie started a hukilau - a fishing festival with luau feast and Polynesian entertainment - as a fund-raising event. From the beginning, it proved immensely popular and provided the inspiration for the well-known "Hukilau" song that begins: "Oh we're going to a hukilau...where the laulau is the kaukau at the big luau." Busloads of visitors drove to La'ie in the 1950s to see Polynesian students at the Church College put on their "Polynesian Panorama" - a production of authentic South Pacific island songs and dances. Cowley did not live to see his dream fulfilled but the vision had been planted in the hearts of others who nurtured and shaped it into reality. 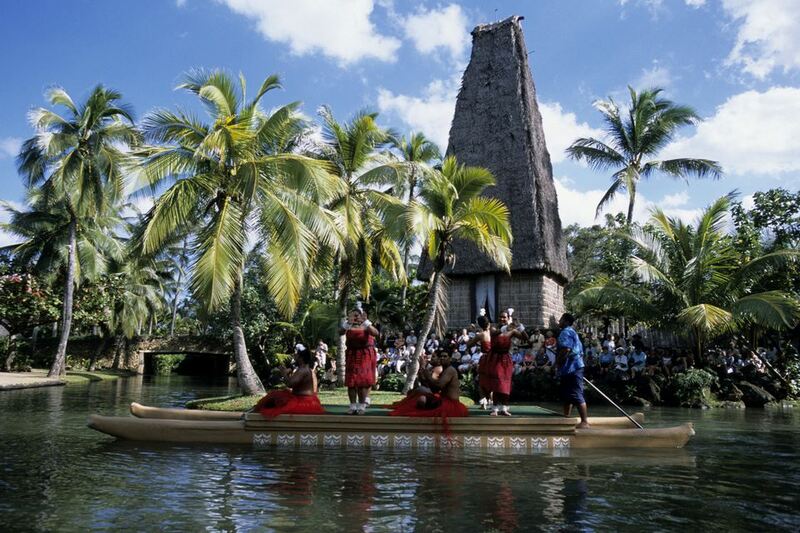 In early 1962, President McKay authorized construction of the Polynesian Cultural Center. He knew the completed project would provide much-needed and meaningful employment for the struggling students in rural La'ie, as well as add an important dimension to their studies. More than 100 labor building missionaries again volunteered to help build the Polynesian Cultural Center's original 39 structures on a 16-acre site that had previously been planted in taro, the native root used to make the staple food poi. Skilled artisans and original materials from the South Pacific were imported to ensure the authenticity of the village houses. The Polynesian Cultural Center opened to the public on October 12, 1963. In the early years, Saturday was the only night villagers at the Center could draw a big enough crowd to fill the 750-seat amphitheater. Following the tremendous boom in Hawaii's tourism industry, however, and promotional appearances at the Hollywood Bowl and on TV's "Ed Sullivan Show," the Center began to thrive. In 1966, the Center was featured in the Elvis Presley film "Paradise, Hawaiian Style." By the late 1960s, the amphitheater had been expanded to almost 1,300 seats. Villagers staged the evening show every night (except Sundays) and sometimes twice a night to accommodate peak season crowds. A major expansion in 1975 relocated and enlarged the Hawaiian village and added a Marquesan tohua or ceremonial compound. The following year a new amphitheater, which now seats almost 2,800 guests, was opened and several other buildings were added to the grounds, including the 1,000-seat Gateway Restaurant in 1979. In 1977, the Center became Hawaii's top-paid visitor attraction according to annual state government surveys. Many other additions followed in the 1980s: an 1850s-era Christian missionary compound; a 70-foot bure kalou, or Fijian worship structure, that dominates the northern end of the Center; The Migrations Museum; Yoshimura Store, a 1920s-style shop with island treats; and totally re-landscaped villages. The 1990s saw a new wave of important PCC products, all intended to ensure that each return visit is a totally new experience. In 1995, the Center introduced a new and exciting night show, "Horizons, Where the Sea Meets the Sky;" a breathtaking IMAX™ film, "The Living Sea;" and Treasures of Polynesia, a $1.4 million shopping plaza featuring a large collection of authentic island merchandise. In 1996, the Center created the Ali'i Lu'au, which takes guests on a nostalgic trip through Polynesia while they enjoy traditional Hawaiian luau food and entertainment. The lu'au was awarded the Hawai'i Visitors & Convention Bureau's "Keep It Hawai'i Award" for the most authentic Hawaiian luau. In 1997, the Center was awarded the O'ihana Maika'i Award by the State of Hawai'i for excellence in service and productivity. The turn of the millennium brought more changes to the Center including the addition of the IMAX™ film "Dolphins", improvements to the front entrance, modifications to the retail sales areas to create a more authentic shopping experience and more. The Aloha Theater was renovated to handle special group functions of 1,000 or more. In response to visitor satisfaction surveys, cultural presentations were lengthened to an hour each to give the visitors more to experience. And, to give them more time to experience it all, the PCC introduced "Free within Three" that lets a guest purchase a ticket for a package and then come back again for two additional days to fit in all that they may have missed the first day. The year 2001 brought the start of many changes to the face of the Center, with more than $1 million in improvements to the front entrance landscaping. In honor of the PCC's 40th anniversary in 2003, even more changes occurred to enhance the beauty, culture and learning guests of all ages and backgrounds. A new front entrance now features mini-museum displays of artifacts from each of the islands represented at the PCC, as well as hand-carved replicas of the various voyaging canoes used in Polynesia. An exhibit featuring the moai statues of Easter Island has opened to round out representation of the Polynesian Triangle. And, an all-new venue and show have been added for the award-winning Ali'i Lu'au. The show returns home to the start of the PCC shows in the Hale Aloha Theater and features songs and dances that take guests on a journey around the Hawaiian Islands and into the heart of Hawaii's people. Imagine what Matthew Cowley would think if he could see how popular his "little villages" are today. He was right in assuming that the Aloha Spirit as practiced by the people of Polynesia would prove to be infectious and that their culture and traditions would endure if they were shared with others. At the Polynesian Cultural Center in Laie, visitors to Oahu have the unique opportunity to learn about the culture and people of Polynesia, not from books, films or television, but from the actual people who were born and live in the area's major island groups. Polynesia - Just the name evokes images of tropical islands, palm trees, crystal clear waters, exotic cultures, beautiful women and strong bare-chested men. Most people, however, know very little about Polynesia. With over 1,000 islands located within a triangle from New Zealand east to Easter Island and north to Hawaii, Polynesia covers an area more than twice the size of the continental United States. Within this "Polynesian Triangle" are over 25 separate island groups and as many different cultures as you'll find anywhere on Earth. Some of these cultures date back almost 3,000 years. During those years, the Polynesians mastered the art of ocean navigation guided by the stars, the weather, the birds and fish, the color and swells of the ocean and so much more. This expertise in navigation allowed them to migrate across this vast area of the Pacific Ocean. Founded in 1963, the Polynesian Cultural Center or PCC is a non-profit organization dedicated to preserving the cultural heritage of Polynesia and sharing the culture, arts, and crafts of the major island groups to the rest of the world. The Center has been Hawaii's top paid visitor attraction since 1977, according to annual state government surveys. Since its opening over 33 million visitors have passed through its gates. The PCC has provided jobs, financial assistance and scholarships to over 17,000 young people from over 70 different countries while they attend Brigham Young University-Hawaii. As a nonprofit organization, 100 percent of PCC's revenue is used for daily operations and to support education. You can read more of the Center's background in our feature on the The History of the Polynesian Cultural Center and Mormonism in Hawaii. About 70 percent of the PCC's 1,000 employees are Brigham Young University-Hawaii students from the actual islands represented at the PCC. These student employees work up to 20 hours per week during the school year and 40 hours a week in summer, in accordance with U.S. Immigration & Naturalization Service regulations governing foreign students. The Polynesian Cultural Center features six Polynesian "islands" in a beautifully landscaped, 42-acre setting representing Fiji, Hawaii, Aotearoa (New Zealand), Samoa, Tahiti and Tonga. Additional island exhibits include the great mo'ai statues and huts of Rapa Nui (Easter Island) and the islands of Marquesas. A beautiful manmade freshwater lagoon winds throughout the Center. In 2008, the Center completed Iosepa: Voyage of Discovery. At the centerpiece of the new attraction is BYU-Hawaii's Iosepa canoe, an all-wood, double-hulled Hawaiian voyaging canoe, originally carved and launched in La'ie, Hawaii. When the Iosepa is not out on instructional sails, it will be housed in the Halau Wa'a O Iosepa, or Iosepa canoe house of learning. The award-winning Ali'i Lu'au takes guests on a nostalgic trip back in time to learn about the royalty of Hawaii while enjoying traditional Hawaiian lu'au food and entertainment, cultural demonstrations, and service with the Aloha Spirit in a beautiful tropical setting. It's the islands' most authentic Hawaiian lu'au. Ha: Breath of Life, is the PCC's new spectacular 90-minute evening show that replaced the long running Horizons: Where the Sea Meets the Sky which had been a visitor favorite at the Polynesian Cultural Center since 1996. The $3 million show utilizes exciting new technology and showcase a newly redesigned stage in the Pacific Theater, a 2,770-seat amphitheater with fiery volcanoes, brilliant fountains, multilevel stages and numerous special effects. The Center also stages a daily Rainbows of Paradise canoe pageant floating cultural show and special events throughout the year. The PCC is home to Hawaii's first and only IMAX™ Theater, featuring Coral Reef Adventure which takes viewers on a tour of the reefs of the South Pacific and demonstrates their value to the people of Polynesia. Every October, the PCC features its own Halloween spectacular, the Haunted Lagoon where visitors board a double-hulled canoe for a 45-minute ride that revolves around the legend of the Laie Lady, the restless, vengeful spirit of a young woman dressed in white who fell into insanity following tragedy many years ago. Pacific Marketplace features an exciting shopping experience filled with authentic Polynesian handicrafts as well as a wide variety of souvenirs, gifts, clothing, books and music by local artisans. You can also visit the Polynesian Cultural Center's website at www.polynesia.com or call 800-367-7060 for more information and reservations. In Hawaii call 293-3333.